Book review and competition to win a copy of sciblogs colleague Anna Sandiford’s book Expert Witness. 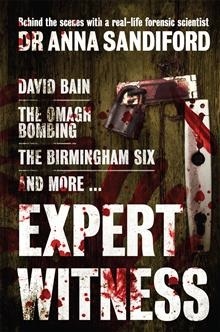 We’re giving away a copy of sciblogs writer Anna Sandiford’s book Expert Witness to a lucky reader. In it she describes what forensic science is really like, and shares tales from the forensic front-line. The book is reviewed below. To be in to win, add a comment after the review giving one question you would ask if you met a forensic scientist. Don’t include your address – the winner will be contacted using the email address you supply to add your entry comment. I’m standing in a large, old, unfurnished room with a partially carpeted concrete floor and only one exit. A convicted murderer stands between me and the exit. Right from the start you know you’re in for a good ride. Sandiford’s style is chatty and easy-going. The humour (British?) comes through, in some chapters more than others as suits their content. This book is about my job and the casework in which I have been involved. I want to give you an indication of how forensic science is applied in a practical sense and an idea of what the job entails. Forensic science suffers from the ‘CSI effect’, as she explains. Her book offers us a personal tour forensic science as it really is. When it comes down to it, almost all of us have some interest in forensic science; we encounter aspects of in the media every week. Interest in Expert Witness shouldn’t be limited to just fans of crime fiction or viewers of TV series like Bones or CSI (which she remarks on in the book), but also for those who simply would like to learn more about a well-known but not especially well-understood activity. Sandiford’s intended audience are adults in ‘the general public’ and her text fits this aim well. This isn’t textbook-ish. The style is more something you might read in an in-depth magazine article. It sheds light on her profession in an easy way–without getting bogged down in minutiae–telling us how forensic science happens in the real world, not the fancy of TV drama. Expert Witness takes readers on a tour of how the author came to forensic science via geology, what forensic science is (it’s not quite what most people think), her casework and the impact of ‘the CSI effect’. She has the advantage of having worked in several countries, England, Wales, Scotland and New Zealand. Comparing the different nations she gives us insight into how forensic science differs in the different nations and how it fits in with the wider legal scene. Her main lines of casework–drink-driving and drug-related cases and analyses of trace materials, pollen analysis, footwear and footprints–are each highlighted in a chapter. Sandiford strikes you as a good observer, it serves the book well. In the aforementioned chapter, in one incident witnessed personally the girlfriend of a squabbling family member specifically kicks her partner in the left buttock, not generally in the backside. Closing the book is her time with the David Bain retrial, a major media event in New Zealand. As she recounts, ’it was like opening a door and walking into the eye of a hurricane.’ New Zealanders in particular will appreciate the inside view on her role in this retrial. While intended for the general public, scientists will enjoy the anecdotes and accounts of working in a non-academic area of science, one most of us have little knowledge of. I like books that give insights or make you think, better still both. One thing I learnt was how an important part of her work was science communication. It seems so obvious in hindsight I feel silly to say it here, but you don’t at first think of an expert witness as a science communicator. Another discussion that particularly appealed to me was the thorny question of testing the databases used in DNA testing. I’m sure readers will find their own insights. As I was saying earlier, forensic science may be well-known, but it’s not well understood. I’m probably going to embarrass by closing with this, but… one word features enough that it caught my attention. Author: Dr. Anna Sandiford, Director of The Forensic Group. Publisher: HarperCollinsPublishers, New Zealand, Ltd. Details: 266 pages, including About the Author (5 pages) andReferences (5 pages). Availability: On-line sellers and widely available in New Zealand book stores (in all of those I have checked). The prologue and the opening portion of chapter one are available on-line (PDF file). My science writing colleagues here at sciblogs will be delighted to know that sciblogs gets a plug early on in the piece (page 46). 1. Those thinking of science careers outside of academia might take note. 2. At one point she offers lists of programmes that different professions shout at. She’d didn’t offer what biologists might shout at; readers are welcome to offer their own suggestions in the comments. 3. As a scientist, there are points I would have liked more detail but that’s a different book, for a different audience. I’ve worked, and even published, in forensic pathology in the past (different life from today!) I never got to speak to the scientists to whom I sent specimens and always wondered what their viewpoint was. I’ve always been interested in what others involved in forensics actually did, but never really had the opportunity to find out. CSI gives interesting stories but is hardly realistic! Your review has really peaked my interest. I’m off to Auckland at the weekend, so the book is firmly on my “to buy” list. As fascinating as the science is I think I’d still want to know how someone dealt with digging into some of the worst results of human behavior and what motivated them to keep going? When the science changes in such as way as to lower the validity of the original conclusion, should the forensic scientist be proactive in declaring this to impacted parties (as opposed to leaving it to defence lawyers to discover and act upon as they see fit)? Thanks for this review. I saw this book on the shelf and thought it might be interesting, but was put off by the cover (which looked tabloid-y with it’s big name cases and gore). I’ll have to grab a copy next time. Do you find yourself getting excited about facets of the case that would normally freak other people out (and editing these sentiments out of conversations)? Do you find it especially hard, leaving your work at work, mentally-wise, or is it easy to let go, because you’d have to or you’d go nuts? Does forensic science only refer to science used for court cases, or are there other forms of investigation to which it pertains ? Do you follow the outcomes of the cases you have worked on? Do you ever think the Judge, jury or counsel must have totally misunderstood you? Do you develop strong feelings about the guilt or innocence of a defendent in a trial in which you are an expert witness? Do you ever enjoy an “a -ha I’ve solved it! !” moment when you are doing a forensic investigation? I’ve heard that in forensics often the scientist knows the details of the case and what side of case they are finding evidence for. Is this actually the case and if so don’t you think it would be better, in terms of determining the facts instead of achieving a verdict, to instead have some level of blinding between the forensics researchers and the investigators? If you were accused of a crime, which country in the world would you rather be tried in (i.e. which do you think has the fairest justice system?). Dear Michael – depends if you did it! I was going to specify that the person would be innocent, but forgot to add that before I posted. Has the popularity of the science (however realistic the representation is) in the form of the many tv shows etc, made offenders more “self-conscious” or aware of what evidence may or may not be left after their crime? Is it becoming more common for offenders to try and cover their tracks more thoroughly? Iâ€™ll keep entries for the free book open until at least the Sunday evening to allow less frequent visitors a fair chance. Donâ€™t feel humorous questions will count against you, if youâ€™re inclined that way. Would love to know how THAT came about! Following up from Paul. Is it even possible these days for offenders to cover their tracks? Is there a sweepstake on the body count? (which we do for TV cops and robbers). A double-banger question: What is the most frustrating area of forensic evidence and investigation at present, and what significant breakthrough do you most hope for in the field? Question: when you look at what forensic science has done for convictions in recent times, do you think future developments in the field could undo/disprove some of today’s forensic work? Do you hate, with a passion, the images put forward by the media (re: CSI – all 20 of them…)? Well, I found the book and bought it. Whether you get the free book or not, I heartily recommend that you buy it and read it. So many of the anecdotes are familiar (as an “expert witness” from a clinical point many times over 25 years), so much of the humour is similar to that I’ve experienced personally. In about two weeks I’ll read it again (I have a degree of dyslexia, it takes two or three readings to completely absorb a book) and expect to get even more from it. I would add to Grant’s review – this is a really good book to read, I think it’s the best one I’ve read all year! Glad to hear you liked it Stuart. Which commonly-used forensic technique or analysis do you have the least faith in, and has anyone ever been convicted because of evidence derived from it? The competition for a copy of the book is now closed. Iâ€™ll let everyone know the results later in the week.